Microsoft’s latest investment is just one example of how the growing digital economy is powering the switch to renewable energy. Microsoft has announced the biggest solar power deal in US corporate history. The technology firm – which already has other renewable energy deals in the US and elsewhere – entered into an agreement with sPower to buy most of the solar energy from its two new power plants in Virginia. It is the biggest corporate solar agreement to date both for Microsoft, and for the US. The plants will produce a total of 500 MW, of which Microsoft will buy 315 MW. The energy will be used to power Microsoft’s Virginia data centers and operations for its cloud business. 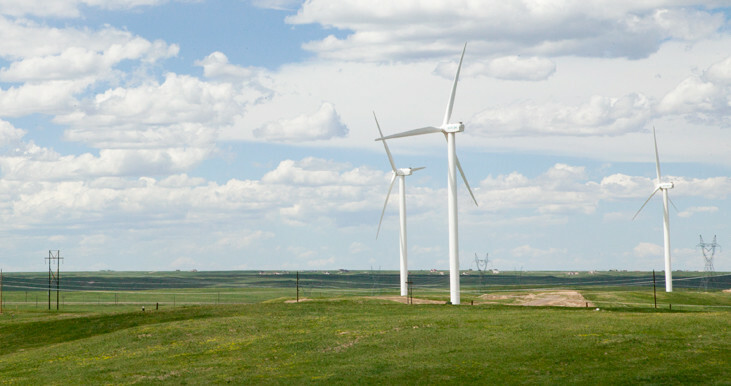 Black Hills Energy is using wind power to generate electricity. Microsoft has now invested in 1.2 GW. That’s enough power to light up 100 million LED bulbs. It already has a 60 MW solar rooftop project in Singapore; a 180 MW wind project in The Netherlands, a 37 MW wind project in Ireland; as well as wind projects in Kansas, Wyoming, Illinois and Texas. 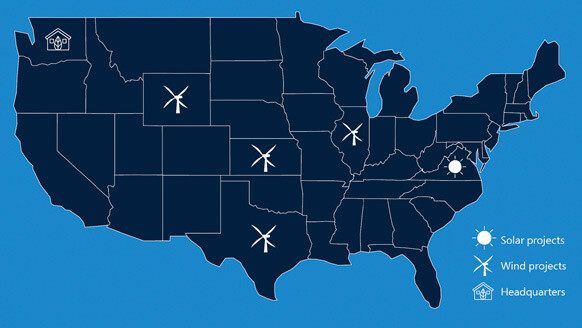 Microsoft's current renewable energy projects in the US. The company wants 50% of the energy used by its data centers to come from renewables by 2018 and 60% by 2020. This latest project puts it over 50%, and nearly doubles the solar capacity in the state of Virginia. Microsoft’s data centers have been 100% carbon neutral since 2012. “This latest development is significant and exciting,” said Emily Farnworth, Head of Climate Initiatives at the World Economic Forum. “It supports the energy transition in a state that has traditionally relied on coal. “It also makes the most of Microsoft's corporate purchasing power and allows local businesses to access renewables in a way they wouldn’t have been able to leverage on their own. About 130 of the world’s biggest companies have signed up to RE100, a global initiative of influential businesses that are committed to using 100% renewable energy. Among them are companies powering the digital economy, such as Google, Facebook and Microsoft. Like Microsoft, these companies are entering into Purchasing Power Agreements (PPAs) directly with electricity generators. Historically, electricity users – both households and large industrial or corporate consumers – would buy their power from an electricity utility. Households paid a flat rate (to keep it easy), while large industrial consumers could negotiate (sometimes). Now, large corporations are increasingly buying their energy directly through PPAs. Between 2015 and 2016, the number of PPAs amongst RE100 signatories increased four fold. For renewable energy developers, signing a PPA with a major company removes significant roadblocks to financing and building new facilities. In the case of the two Virginia power plants, sPower’s CEO Ryan Creamer described Microsoft’s involvement as “a game-changer” that helped the project to “move forward and come to fruition at a time of regulatory uncertainty”. Farnworth said PPAs are an important trend for global electricity markets.